UNP Matara District MP Buddika Pathirana today said he has been subjected to different kind of treatment in Parliament at times. Mr Pathirana came out with this remark when Speaker Karu Jayasuriya hailed him for raising oral questions on the cultivation of medicinal plants in Sri Lanka. “Raising oral questions about the cultivation of medicinal crops continuously is commendable" the Speaker said. “Thank you Mr Speaker but some MPs laugh at me for raising such questions. My intention is to help the promotion of medicinal crops" he said. Dont worry - Your efforts will yield good results in time to come .Those who laughs are idiots .They do not even attempt or encourage but keep commenting. It's a laugh of envy. When people chase away, or die away, these useless old school corrupt politicians, you will be able to rise and shine. In that sense it is a blessing that you didn't get into the cabinet. It's an opportunity to start afresh. Because they are all sick and believe that laughter is the best medicine!!! You are one guy who will be re elected again. The longivity of those who laugh at you will be only last till the next election. So be patient you have time on your side. Yes, some may laugh at you for taking about cultivation of medicinal plants. We cry when we talk and think about the Bond Scams and the on going corruption. Why not switch topics? You should not be laughed at but your close relatives deserve to be laughed at for trying to hide unpleasant facts about members of his profession. I THINK HE IS A MBBS SYLLABUS COVERED PERSON , HE MUST BE HAVING A THOROUGH KNOWLEDGE ON BIOCHEMISTRY , THAT HELPS TO IDENTIFY MEDICINAL AND HERBAL PLANTS. After long time suddenly we could hear a useful news from you. Honestful Mps like you never offered a minister post from the big shots ever. They are afraid your may become the PM or President. 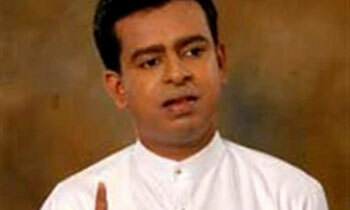 Buddika Pathirana you are young enough to lead the country All the stones what they throw at you turn into milestone . Dont worry continue your good work. Not only mps. We, general public also laughing at parliamentarins .